We have now officially reached the time of year when commercialism and the pressure to abide by modern values has peaked. As Practitioners of the true Craft it is often challenging to maintain our Pagan beliefs and customs while being bombarded with the popularity of Christmas. This is the exact problem one of our dearest brother practitioner messaged us to discuss. 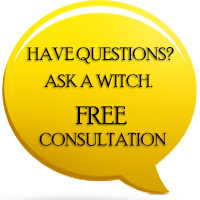 We have known this client for quite some time and had the pleasure of watching him grow in his Pagan beliefs and knowledge. It was truly a blessing for us to help guide his devotion through the coming Christmas haze. Here is his message, below. My Christian family has invited me over to celebrate Christmas Eve and Day with them this year. I do not usually like to indulge negative thinking but in this case I can’t stop myself. Spending time with my family over this type of holiday season is pure misery. My father left us for the Spirit World a few years ago and ever since his passing all my family ever does is fight. Get-togethers always follow the same pattern, first an argument breaks out between two and then a full fight between everyone. It really feels like there is no love left in the family. I’m also not fond of having to compromise my Pagan beliefs just because my family wants to celebrate Christmas. They have never truly been supportive of my path. Please tell me how I can maintain the sanctity of my beliefs while enduring this holiday with my family. This is an honest problem us members of the 7witches Coven struggle with too. However, there is a simple solution we have often used to cope with the aggressive nature of modern Christmas. The solution is Witch Balls. A Witch Ball is a tool used by Practitioners to trap negative malicious energy before it can destroy harmony. It is a clear and hollow ball which is filled with blessed and imbued items holding significant power. To create your own Witch Ball, you will need a series of common crafting elements: clear globes, herbs, twine, rocks, crystals, plants and any other possible fillings. The main goal of crafting a Witch Ball is to ensure there are some coarse materials incorporated with symbolic materials. Below, are two sample Witch Balls we purposely created to put on a Christmas Tree. These two Balls were specifically designed to help PaganforChristmas and his troubles. However, they can be used by everyone. We began crafting the Ball of Peace by finding elements that would hold a peaceful energy. We chose to use the color blue as this holds the power of serenity, trust and calm. We used a crystal to maintain clarity of the mind even during strife. Seashells and stones hold the essence of the serene beach, while blue quartz attracts peace. 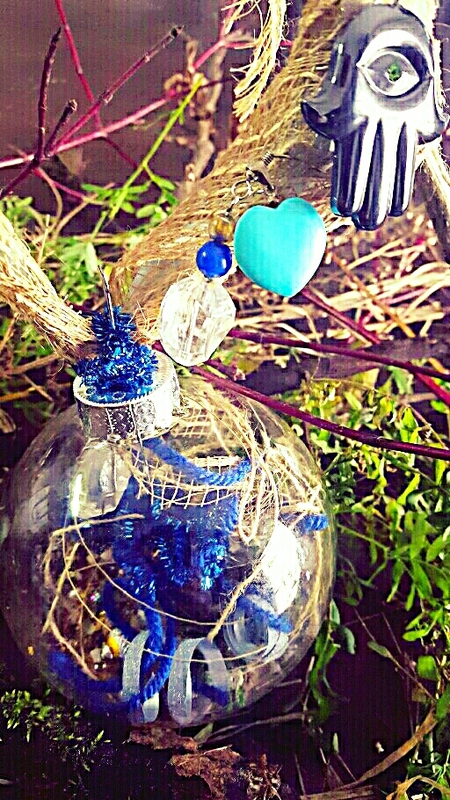 We of course added shiny blue twine to attract and entangle negative energy. Then we inserted chamomile leaves for soothing energy. Finally, we attached our Imbued Hamsa Hand of Defence and our own Charm for Sunlight, to further empower the Ball’s protection of Peace. To craft our Ball of Love, we began by selecting feathers and tokens in the color red. Red will of course infuse the Ball with the passion of life-blood. We next used gold twined string to entrap negative energy from harming the richness of pure love. We used small pearls, rose quartz and crushed crystals to attract love from the clear innocent heart. We also inserted spices and herbs used for warm and sweet tastes, such as cinnamon and aloe to draw in fresh new love. Finally, we added our Blessed Gold Heart Charm to provide an extra boost of loving energy in the Ball. Though these two Witch Balls were crafted for PaganforChristmas’s personal problems, anyone can use them over the holidays. 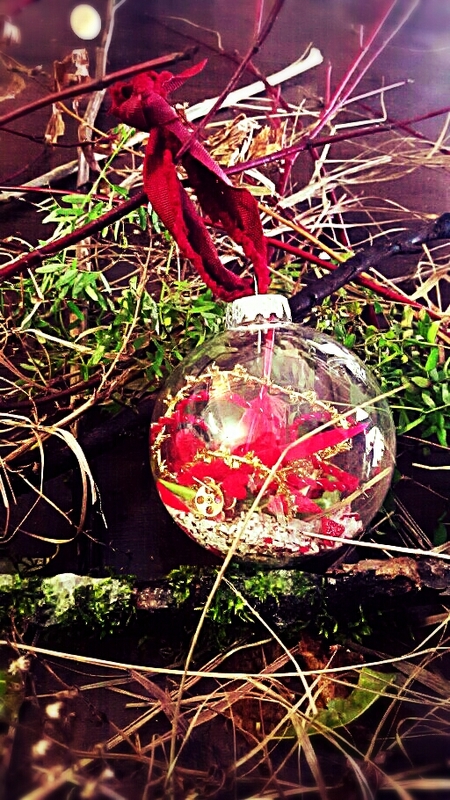 Craft these Witch Balls for yourself and watch as you experience the Magick of a peaceful and loving winter holiday.